View More In Hunting Dog Equipment - Page 2. The PetPal S.P.O.T. trainer by D.T. Systems is an LED lighted dog collar with a built in vibration training option. The LED lights and reflective collar help make your dog more visible in low light situations such as early morning, or late evening walks. The exclusive Night Sight technology powers the S.P.O.T. rechargeable training collar, and uses LED lights to illuminate the dark with up to 42 lumens of brightness. The S.P.O.T. has 3 basic settings: constant low (21 lumens) , a constant high (42 lumens), and a blinking/strobe feature. An adjustable strobe feature can be used at any time at the push of a button with 16 different illumination levels. The bright orange collar belt features a highly reflective surface that helps make your dog even more visible by reflecting any light source. Vibration Assist technology is incorporated into the collar to offer a vibration only training alternative. 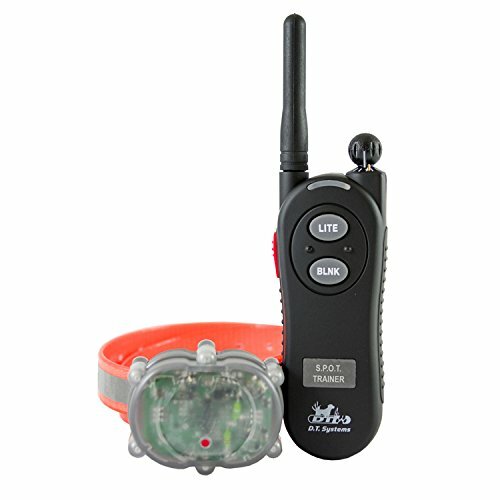 The rugged micro-sized collar unit, weighs less than 4 oz, and the compact and easy to use transmitter (remote control) fits in the palm of your hand. The comfortable waterproof collar easily adjusts to fit small to large dogs. If you have any questions about this product by PetPal, contact us by completing and submitting the form below. If you are looking for a specif part number, please include it with your message.